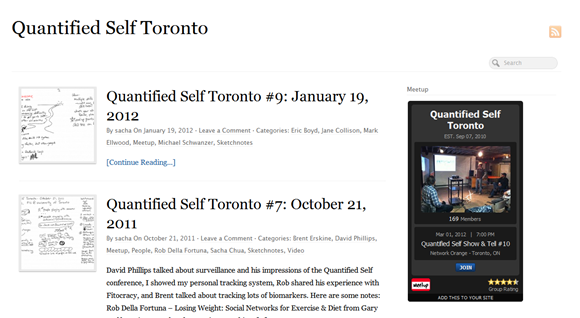 Quantified Self Toronto is a lively meetup around self-tracking and life experimentation. I like the group, and I pick up lots of inspiration every time I go to one of the meetups. There’s one tonight (March 1, 7PM, 221 Yonge St. Toronto), and 48 people have said that they’re going. Neato! I want to make it easier for people to share what they’re working on, learn from past meetings, and connect with each other. I spent the morning organizing my sketchnotes from past meetups. (Oddly enough, I don’t have any notes from even-numbered meetups…) I want to flesh this out with a directory of members’ profiles, maybe eventually building this into something like Think Try Learn or linking to people’s profiles there.